I am currently in the depths of catering hell. Well, not quite, but I can pretend in the hopes of getting sympathy right? Suffice it to say that while I am actually making a bunch of food for an event, it is generally going smoothly so the h-double-hockey-sticks is a bit of an exaggeration. I have successfully finished four deserts and am currently taking a short break from prep work for tomorrow’s breakfast. I figured what better time than now to share with you, my readers, the most excellent creation I conjured forth – Red Chili Brownies. Now, I realize that this is not an entirely unique creation. In fact, chocolate and spice seems to be the thing these days, but I am proud of myself for the original recipe nonetheless and am hoping that some of you might enjoy nibbling on a few of these while imaging yourself in the Land of Enchantment. For those of you familiar with the local fare, Red Chili is a staple in northern New Mexican food. Everyone seems to have an opinion about how to prepare it and while I do not purport to be an expert, I certainly have my own preferences. I tend to buy red chili powder, rather than pods, and use it as a seasoning for sauces and other savory dishes. This was my first foray into spicey-sweet. I wish my camera was working because these things are beautiful. Basically I started with pan of brownies, which I then cut into circles with a biscuit cutter and topped with a thick bittersweet ganache and a dash of red chili powder. They are bite sized pieces of marvelosity. Which I realize isn’t a word but it certainly describes these little morsels! *Depending on how hot you like it! I use about 1 TBSP because I am a whimp! Preheat the oven to 350 degrees and grease and flour a 9×13 baking dish. Melt the chocolate and butter together in a double boiler. Once melted, remove from heat and let cool to room temperature. Whisk the flour, red chili and cinnamon together in a bowl and set aside. While waiting for the chocolate to cool, beat the eggs and salt until light and foamy. Add the sugar and beat until mixed. Slowly add the cooled chocolate to the egg mixture, stirring while you do so in order to incorporate the chocolate fully. Fold the flour and chili mixture into the batter until just combined. Pour into the prepared baking dish and bake until just set, so that a toothpick stuck in the center comes out somewhat cakey, about 18 minutes. Heat 1 c heavy cream over a low heat until it just starts to simmer at the edges and begins to form a skin. Pour an 8 oz bag of bittersweet chocolate chips into a heat proof bowl and then pour the hot cream over them, stirring until the mixture is smooth and uniform. Spread over the cooled brownies and sprinkle lightly with red chili powder. Now that my goat is back in milk, I am back to my cheese making rituals. The girl I have in milk at the moment is giving me nearly a gallon a day already, and will probably give me more in the next month or so. One of my favorite cheeses to have on hand is ricotta. Ricotta is really a by-product of other cheese making, as it is made by reheating the whey left over from the drained curds of any other cheese. The actual ricotta itself is the small pieces of protein, known as albumin, and when the whey is recooked the proteins denature and if you have fine cheesecloth on hand you can strain it and get ricotta! There are many uses for this cheese, but my favorite use is in baking. Ricotta can be used to make cheesecake like tarts, adds great flavor and texture to baked goods such as cakes and muffins, and of course is used frequently in baked pasta dishes such as lasagne. I like to experiment with it as it is very forgiving and last night in an effort to make some room in my fridge, I came up with this fabulous recipe. Begin by making the pastry. You can use a food processor to speed this up. If you are going to mix it by hand, it is helpful to have the butter softened. Whisk the flour, sugar and salt together. Add the butter and combine, with the processor or a hand held pastry blender, until you have the appearance of coarse crumbs. Add the egg yolk and mix until it just comes together. Pour into a 9 inch tart pan and shape with your hands. Prick holes in the tart shell with a fork (or use pie weights to keep it from bubbling) and bake at 400 degrees for about 15 minutes or until it just starts to brown. While the pastry is blind baking, make the filling. Mix the ricotta with the egg white, whole egg, vanilla, sugar and hazelnut flour. Whisk until well mixed. Remove the tart shell from the oven and add the mixture. Return the filled shell to the oven, lower the oven temperature to 375 and bake until the tart sets, This should take about 35-45 minutes depending on the texture of the ricotta. Home-made ricotta tends to have more liquid in it than store bought and will take longer to set. While the tart is baking, slice the peaches in half and remove the pits. Thinly slice the peaches, keeping the skin on, and place in a bowl with a tablespoon or two of sugar. When the tart is set, remove it from the oven and place it on a cooling rack. Arrange the peaches on top in whatever pattern you want, being sure to include any juices that have accumulated while the peaches were macerating. Let cool and serve. According to Chinese Medicine, spring is the time for cleansing and for renewing. The liver, the organ responsible for the smooth flow of qi, loves spring and can be both nourished and frustrated during this time of year. Wind, another spring favorite especially here in Santa Fe, is another symbol of the liver. As a result, many of those spring cravings can be linked to the bodies desire to naturally detoxify and move all that rising energy! Great spring foods can also be found in the oddest of places. Dandelions, those pesky weeds, are a great spring tonic. Pick the greens (making sure they haven’t been sprayed!!) and add them to your salad for a nice change. As previously mentioned asparagus can act as a diuretic, pulling toxins out of the body with the excess water. Rhubarb, another favorite of mine, also has cleansing actions and can be a great addition to spring treats – like a fabulous rhubarb pie, for example! There are lots of great greens and other things that I have missed over the winter and I encourage everyone to get out to your local farmer’s market to get some. One of my favorite ways to get all the spring veggies together is to make a nice pasta primavera (remember, primavera means spring!). Here is my version of the classic dish. Begin by placing the pasta water on to boil. While you wait, heat the olive oil in a large saute pan over medium heat until aromatic. Add the onion and garlic and saute until the onion is translucent. Add the asparagus and carrots and cook for about 3 minutes, or until the carrots soften and the asparagus starts to change color. Add the peppers and the summer squash and cook, stirring frequently, until the vegetables are done. Add the heavy cream and the cheese and stir to mix and turn the heat to very low. Add salt and pepper to taste. When the past water has boiled add your pasta and cook until al dente. Fresh past should only take a minute or two, but dried pasta usually takes between 7 and 10 depending on the style. Strain the pasta and add the noodles to the pan of sauce. Toss several times to coat the noodles and serve! A friend of mine recently gifted me with a package of Rancho Gordo beans. Variety, Runner Cannellini Beans. I have been wanting to try these things for a long time, nearly nine months, and yet I haven’t taken it upon myself to purchase any. Suffice it to say I was very excited about trying them out and decided to improvise a dish using some cubed pork and Italian inspired ingredients. The result was quite delicious so I thought I would share it! Begin by soaking the beans for a few hours to soften them. This can be done overnight if you’d like. Drain and place beans in the pot. Cover with six cups of water, add a couple of slices of the dried zucchini and let cook over low heat for about two hours. For the pork, heat about two tablespoons of olive oil in a cast iron skillet. Add the cumin and fennel seeds and let sizzle for a few minutes. Mix the flour with a bit of salt and pepper. Dry off the pork with a paper towel and dredge in the flour, then place in the oil. Brown the meat on all sides then transfer to the bean pot. Add the chicken stock and tomato sauce as well as the remaining dried zucchini, basil and oregano. 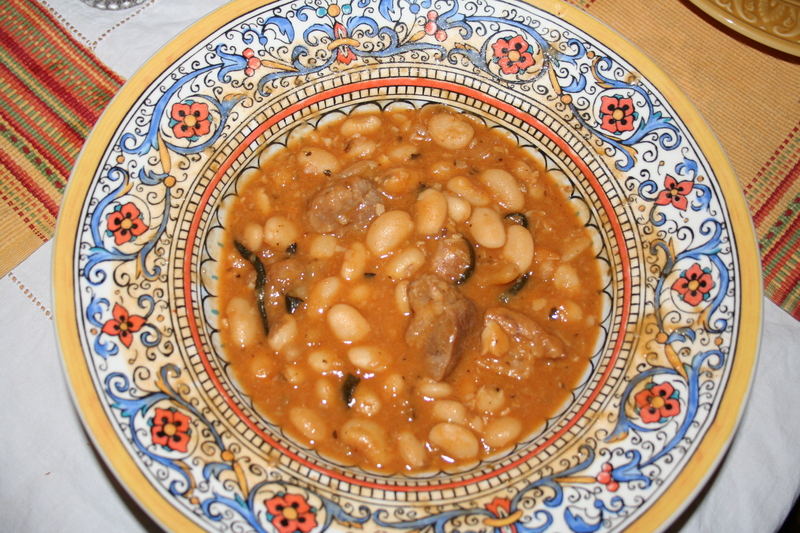 Let cook for another hour or until the beans are soft and the meat is tender. Serve over polenta and enjoy! I am really looking forward to the new year, especially since I received some really nice gifts for the holidays (kitchen related of course!) that I anticipate using a lot in the coming months. For one I finally got the KitchenAid Mixer that I have been lusting after forever, complete with a grinder and a pasta extruder attachment! So now I can make my own sausage, ground beef, and extruded pasta! I also received a hand cranked pasta extruder which makes different things from the aforementioned automatic one. I actually used the hand cranked one last evening to create a delicious dish of large macaroni in a mushroom bechemel sauce. It turned out fabulously and the noodles were delicious. I included the recipe, simple as it is, below. Honestly I have been feeling rather uninspired when it comes to cooking these days, and as a result I have not been writing here as much as a result. I like to think that my new toys have given me some much need inspiration and I am really looking forward to some kitchen experimentation in the coming weeks. I hope that all of you are enjoying 2011 so far and that the year brings each of us the abundance we deserve. Happy New Year and Happy Eating! Grease a 9×5 inch baking pan. Melt the butter over low heat. Add the onions and stir for about one minute. Add the flour and whisk off the heat until blended. Put back over the heat and add the milk. Season with salt and white pepper to taste. Increase heat to medium and cook until thick, whisking frequently. Set aside. Saute the mushrooms in butter or olive oil until they have released all their moisture. Add to the bechemel. Cook the noodles to al dente consistency. Drain. Mix the noodles with the sauce and pour into the baking dish. Cover with the Parmesan and place in the oven for 15 min or until the sauce is bubbling and the cheese has browned. So after perusing the goat forum I frequent (yes I realize I am kind of a loon) I decided to try a recipe posted for Cajeta. I modified it a bit because the original recipe called for corn starch. I try to avoid corn starch if at all possible because I have yet to find any that isn’t from GMO corn. Instead I used arrowroot powder. I have had success using it as a substitute in the past and this time was no different. When using arrowroot powder as a substitute for corn starch, you want to use it at a 2:3 ratio. So if your recipe calls for 2 TBSP of corn starch, you use 4 tsp of arrowroot powder. A TBSP is = to 3 tsp. Unfortunately, due to an “accident” the Cajeta is not particularly beautiful and as a result I refuse to post pictures of it! I admit to being totally confused as to the addition of the baking soda, but perhaps a knowledgeable reader can let me know what purpose it serves! Of course, I scorched mine! You have to continue stirring regularly towards the end of the process or this will happen to you! I decided (due no doubt to the fact that I am sick) that I didn’t care about the weird brown bits. After tasting it I decided it was fine, didn’t taste at all burnt, and after over three hours of work I put it in jars anyway and moved on. This doesn’t have to happen to you, however. Simply stir continuously in the last 30 minutes or so and you will avoid getting speckled Cajeta. The flavor is great and I am really looking forward to getting some apples and making some horribly decadent tart with it soon. I will, of course, post about that when I make it! Until then, happy eating. It may seem early in the season for apple recipes, but I was lucky enough to be given the opportunity to pick a business associates early fruiting tree and I finally got around to doing something with all the apples I pulled. The apples were very small and the process of peeling and coring was fairly tedious, however we were able to do enough so that we could make about 4 pints of apple butter. The process of making apple butter is very straightforward but it can be time consuming so I decided this year to use my crockpot in order to cook the apples down rather than the stove top which requires frequent stirring and constant vigilance in order to ensure it does not scorch. Given all of the other things I have been trying to do recently (cheese making, zucchini processing, alone time…) I decided that it would be best for everyone if I simply put the apple butter in the crockpot overnight and let it do its thing without my supervision. I was very pleased with the results! The butter thickened nicely and while there was some scraping of the sides required in the end, all in all it was a preferable method to the stovetop. I tend to forget that things are on the stove and have had some near catastrophes (see my post about the plum preserves!). The best part about it though is that you can leave it to cook overnight. I like getting things done while I sleep! I typically use less sugar in these recipes than called for simply because I don’t like overly sweet fruit products. The Ball Blue Book recipe calls for 4 cups of sugar to 8 cups of apples. No thank you! I use about 1 to 1.5 cups of sugar. I also add a tad more cloves to my recipe (1/2 tsp instead of 1/4 tsp) and lower the cinnamon from 2 tsp to 1 tsp. The canning instructions are to can for 10 minutes (at sea level) with 1/4 inch head space. Due to the altitude in the City Dipherent, I add an additional 15 minutes to the processing time.